Rounding out my five-day journey through Mill Creek’s Drive-In Movie Classics collection is the 1983 adventure/fantasy Prisoners of the Lost Universe, a film so incredibly silly that you can’t help but admire it. Noted scientist Dr. Hartmann (Kenneth Hendel) claims to have created a teleportation device that transfers objects from one dimension to another, and Carrie Madison (Kay Lenz), host of a science-themed TV show, is about to interview him. But when a series of earthquakes hits the area, Dr. Hartmann, Carrie, and a repairman named Dan (Richard Hatch), who inadvertently stumbled into the laboratory looking to use the phone, are transported to a mysterious world populated by cavemen, monsters, and warlords. One warlord in particular, the mighty Kleel (John Saxon), takes a liking to Carrie, and, after shooting Dan, forces her to accompany him back to his village. After recovering from his wound, Dan teams up with a green-skinned archer (Ray Charleson), a thief (Peter O’Farrell), and a mute caveman (Philip Van der Byl) to rescue Carrie so he can return with her to the world they left behind. Prisoners of the Lost Universe brings a whole new meaning to the term "goofy”. Even the opening scenes, set in the so-called “real world”, are ridiculous. As Carrie is driving out to Dr. Hartmann’s place, the radio station she’s listening to in her car warns that a few tremors, which recently shook San Francisco, are “on their way” to Los Angeles, and should be arriving any minute. As if on cue, a minor earthquake ensues, and as soon as it’s done, the radio announces the tremor registered a 4.5 on the Richter scale. Amazing, isn’t it? Not only can they predict when an earthquake is about to hit, but they also have access to real-time Richter scale measurements, which they transmit a split second after the quake occurs! Who needs scientists when a Top-40 radio station can do all that? I know… I’m nitpicking. Still, I couldn’t help but think this early bit of absurdity was a sign of things to come. And sure enough, it was. After another quake sends the three main characters spiraling into another dimension, the action shifts to a "strange land", where our heroes encounter everything from a caveman stuck in the mud to an underwater zombie. There's even an aggressive tribe of humanoids with bright red eyes that sound just like a mountain lion when they’re agitated. I could go on and on, but what’s the point? Every few minutes, something hilariously cheesy happens. Even the great John Saxon is a bit off in this one, delivering an unconvincing performance as the film’s heavy. Truth is, I couldn’t have picked a weirder movie to close out this 5-day mini-marathon. 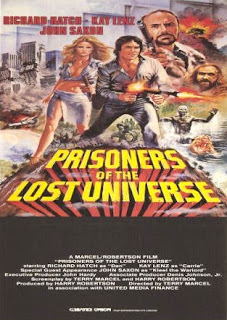 An adventure that lacks excitement and a fantasy devoid of imagination, Prisoners of the Lost Universe is gloriously bad. I loved this as a kid and haven't seen it in years. I think I rented this film for a solid week from my local video store. I'm going to have to track this down.